Two robots of the red alliance operate in this FIRST Robotics match in Waterbury in early March. At center, Team 177’s robot is carrying a beach ball piece of cargo to load in the horizontal space craft at the right. Hatch covers must be installed to secure the cargo. At left, Team 176’s robot is operating next to a cargo rocket standing vertically. The opposing alliance’s robots are evidently elsewhere on the field. The red alliance was the runner-up in this three-day meet. Aces High, Team 176, our local collaborative FIRST Robotics team, got a great start in their initial meet this year at Wilby High in Waterbury on March 7-9. They had worked hard in the last few weeks, and their robot seemed ready. The team did well in the qualification rounds on Saturday and early Sunday, ending at the top of the rankings, in spite of problems with the vision system. These were fixed by late Saturday. As No. 1, Aces High could make the first pick during the alliance selections Sunday morning. They chose Team 177, the Bobcats, a veteran winner from South Windsor who they knew from experience would make a great partner. From scouting data on Saturday, their choice for the third alliance partner was Team 6723, the Mechanical Mounties from Williamstown, Mass. 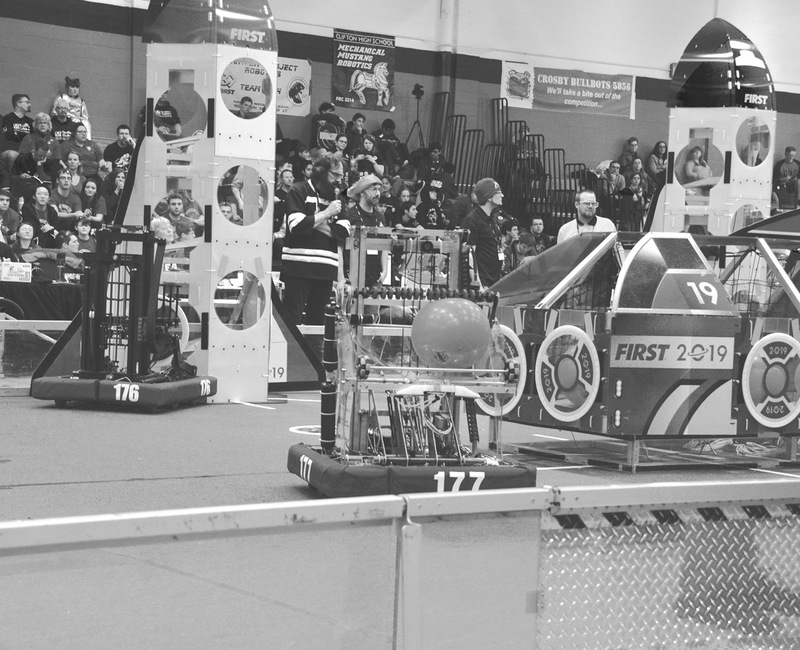 The Mounties were in only their third year in Robotics, but showed a demonstrated ability this year to climb onto the second-level platform at the end of a match for extra points. The selections were good, and the alliance won well, with two straight victories in each of the first two levels of elimination play on Sunday. But in the play-off level, the failure of Team 6723’s communication system denied that final climb, and the alliance lost the first match, 73 – 74, and the second at 77 – 83, so Team 176 and its partners took home only the Finalist medals. The leader of the winning alliance was Team 230, the Gaelhawks from Shelton, another veteran winner. The game this year, as explained in the March issue of the Observer, was called Deep Space, with a space travel theme and a complicated set of scoring rules. Evidently Aces High had designed and built a competent robot and understood the game well. Not only were they the runner-up in the Waterbury meet, they also won the Motorola Quality Award for the second time. After Waterbury, the team had two weeks to hone their operational skills and make sure that the robot is ready. Their next match was scheduled for March 22-24 at Western New England College in Springfield.